Rangers' Stick to Game Plan, Rangers Win. Any Questions? 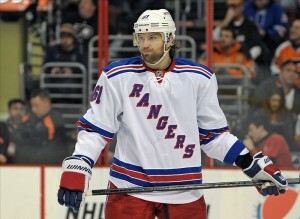 Rangers’ Stick to Game Plan, Rangers Win. Any Questions? Going into Saturday’s game against the Tampa Bay Lightning, the Rangers’ unexpectedly lackluster 3-4-0 start to the 2013 season had many fans hitting the panic button. Many worried that the loss of roster staples like Brandon Dubinsky, Artem Anisimov, Brandon Prust and Ruslan Fedotenko had altered the chemistry of the team; that Rick Nash, despite his obvious skill, was not working out on Broadway, destined to become just another big-name bust. Well, first and foremost, seven or eight games are not enough to deem a player a bust – period. If nothing else, the lockout-shortened training camp didn’t give teams much of a chance to gel before the start of the season. This is especially true of teams like the Rangers, who made significant roster changes in the offseason. And while more is expected of him, even while not producing as expected Nash has already evidenced himself to be the most skilled player on the ice, with the possible exception of Marian Gaborik (who has been, in this writer’s estimation, the team’s best overall player to start the season). One player who had frustrated at nearly every turn through the first seven games of the season was Derek Stepan, who, going into Saturday’s matchup, had not scored a goal since last April. One of Stepan’s strongest attributes is his hockey sense, and that intelligence seemed to be AWOL far too often to start the season. Similarly, Carl Hagelin, whose goal drought dated back even farther than Stepan’s (to last March), had also made uncharacteristic errors and head-scratchingly frustrating plays in the early going this year. Both Stepan (whose overall performance against Tampa was superlative) and Hagelin finally tallied, Hagelin with the eventual game-winner. The Rangers’ other goal was scored by Nash, in highlight-reel fashion, and just served to illustrate – yet again – the level of skill the winger has to offer. I liked Dubinsky and Anisimov as much as anyone (and am quite happy to see the success that Anisimov, at least, is having thus far in Columbus), but Nash is worth two of each, and that is patently obvious every time he has the puck, whether he scores or not. The main thing the game against Tampa should have hammered home to fans and players alike is that regardless of who is in the lineup, if the Rangers stick to the kind of play that has brought them success in the past, they will continue to have success. Going into Tuesday’s matchup versus the New Jersey Devils with a slightly altered lineup – having dealt 4th line winger Mike Rupp to Minnesota on Monday for Darrell Powe and Nick Palmieri, and also called up 2011 first-round pick, center J.T. Miller, from the Connecticut Whale – it’s worth hoping that they will remember that.